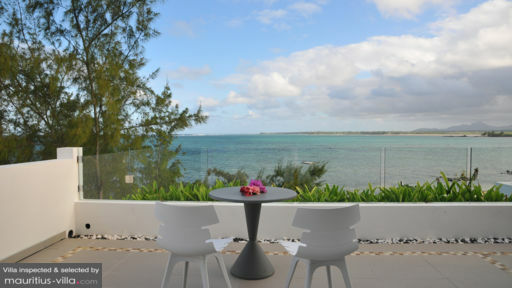 Seamlessly blending comfort and style, Penthouse Blan Korai is beautifully conceived to help you enjoy a memorable holiday in the paradise island of Mauritius. Located on the highest floor of the luxury Residence Korai, this penthouse is ideal for anyone who wants to enjoy a lavish lifestyle, complete with glorious sea views and even a rooftop terrace. As a guest of the villa, you will also be entitled to different types of services that will render your stay even more enjoyable. Penthouse Blan Korai comes with three bedrooms which can very comfortably accommodate up to six different guests. To shelter you from the tropical heat, all the bedrooms are fully air-conditioned and they each come with en-suite bathrooms. The master bathroom also includes a large bath tub, shower, safe and dressing area. If you are a group of 10, rent the penthouse with Studio Ver Korai and Studio Oranz Korai can be an option. Both studios located on the same building as the penthouse. With an infinity pool right on the rooftop, rest assured that you’ll be able to enjoy a refreshing dip any time of the day or night. The pool overlooks the ocean, creating a perfectly harmonious setting which is ideal for rooftop parties with your loved ones. Guests of the villa will also be able to make full use of an outdoors living area. In the common ground of the residence, you’ll find a lush tropical garden with sun loungers and various other amenities. Outside, there’s even a communal lap pool that measures 12.5m x 4m and even a jacuzzi where you can soak in as you enjoy the delightful fragrance of the tropical flowers. A barbecue grill has also been set up on the terrace. Guests will need to purchase their own coal before hosting outdoor barbecue parties. With a spacious living area of 465 m², Penthouse Blan Korai boasts a spacious dining area which can easily accommodate your guests. 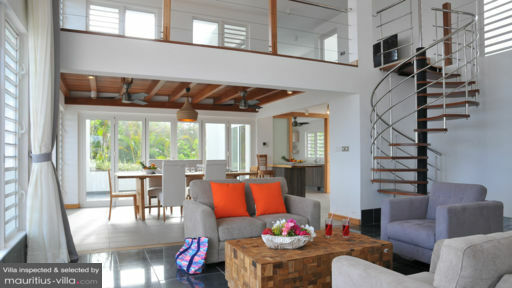 Additionally, you’ll also be able to make full use of the airy living room which provides excellent views of the ocean. Because this villa is entirely self-catering, you will be able to enjoy different types of amenities and accessories that have been set up to help you comfortably prepare your own meals. For example, you’ll find a kettle, Nespresso machine, toaster, microwave, convection oven, induction stove, freezer, fridge, tumble dryer, washing machine, dishwasher and a plethora of cutlery which you can use to your liking. In the living areas, you’ll also find an ironing board, flat-screen television with satellite channels and even a sound system, complete with Bluetooth. 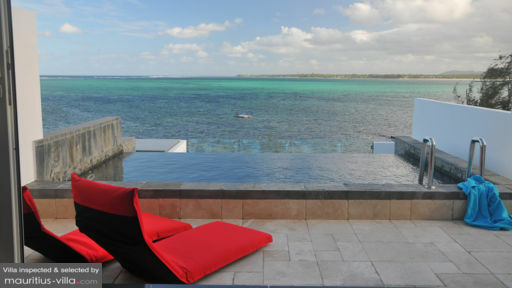 To enhance your vacation and ensure that you won’t need to muck about with tiring chores and similar housework, the villa offers the services of a housekeeper who can show up seven days a week, including public holidays. Every four days, your beach towels, towels and linens will be changed. For an additional fee, guests can also enjoy different types of services such as yoga classes, bike rentals, personalized trainer, in-house spa treatments, in-house chef, chauffeur, baby sitting, airport shuttle and the likes. Located in the pristine coastal village of Poste Lafayette, Penthouse Blan Korai places you a mere hour from the capital of Port Louis, where you will be able to sample as many local delicacies as you want, thanks to the numerous food stalls in the surroundings. The public beach of Poste Lafayette is also a short two minutes away from your villa.